According to regional newspaper le Dauphine Libere the mountain town of Passy close to Mont Blanc is France’s most polluted town. A report from Air in the Ain and Savoie region (Air APS) says that in 2008 Passy registered an annual average of 3.9 nanogrammes / M3 of Benzo[a]pyrene. A national record. Worse than in the heavily industrialized region south of Lyon! Didier Chapuis the director of Air APS says the component “is effectively very dangerous”. The are biologically active molecules which are highly cancerous and can combine with molecules in animals causing cellular malfunction. They can also adversely affect the immune system. Passy has magnificent views of Mont Blanc and is home to the ski area of Passy-Plaine Joux. It is also one of the areas included in the Annecy 2018 Winter Olympics. An athlete’s village is scheduled for the town. I’m no scientist but I’m convinced the problem is due to the traffic heading up and down the ATMB to the MB tunnel and due to the geography of the valley the smog hangs there for days as it can’t escape. 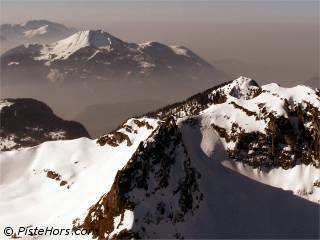 When I come down to the valley from Les Contamines I can feel the pollution in the back of my throat. Yup apparently both the incinerator and diesel traffic are implicated. I guess they can do something about the incinerator. The road traffic is maybe harder to deal with. With Annecy <-> Chamonix taking 3 hours by train and Annecy <-> Geneva taking nearly 2 hours (20 minutes by car) you can see why people prefer their cars. Public transport is very poor in the Haute-Savoie. I looked at taking the train to go ski touring but the service is not usable. Smog is a huge problem, it’s what makes Mexico city so polluted as well. We should think about this to over come on this smog problem,other wise it can create serious problems in Mexico regarding health and environment.